The structure has been recently renovated and is also equipped with a convenient lift to facilitate the ascent to the upper floors. The interior common spaces are very large and comfortable, tastefully furnished and all equipped with air conditioning. Guests can then enjoy splendid panoramic verandas where reading, playing cards, sipping a coffee or eating an ice cream. The Hotel has a large and bright dining room with a panoramic view of the sea where guests can enjoy home-cooked, genuine dishes prepared with attention to detail; at lunch and dinner two-course menus are offered with a choice of fish or meat specialties, typical dishes of the Marche region and always excellent fresh pasta made by hand by our chefs every day, embellished with always different and tasty condiments. On request it is possible to arrange special menus for those with food intolerances, for celiacs, for vegetarians or in general for those who are forced to particular diets. 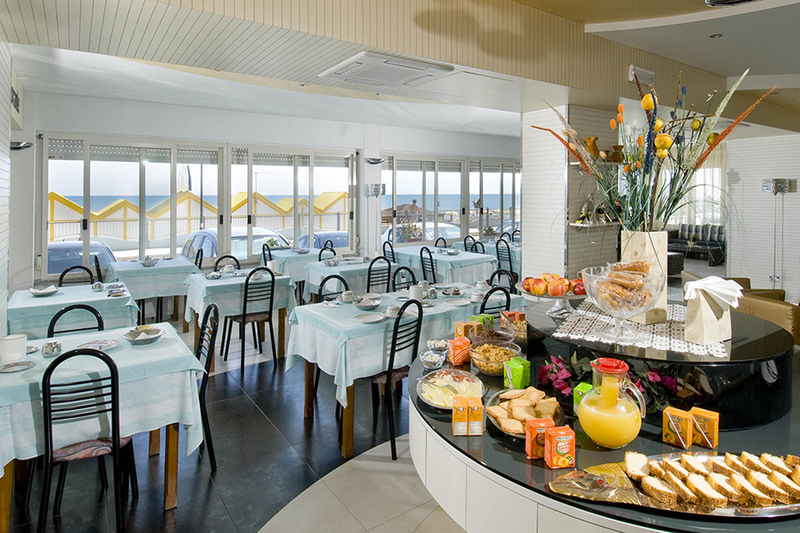 Breakfast includes buffets with fresh fruit, homemade desserts, croissants, jams but also cheeses and cold cuts. The hotel has a modern bar with direct access to the beach, open from morning until late evening for relaxing and pleasant evenings by the sea with other guests.